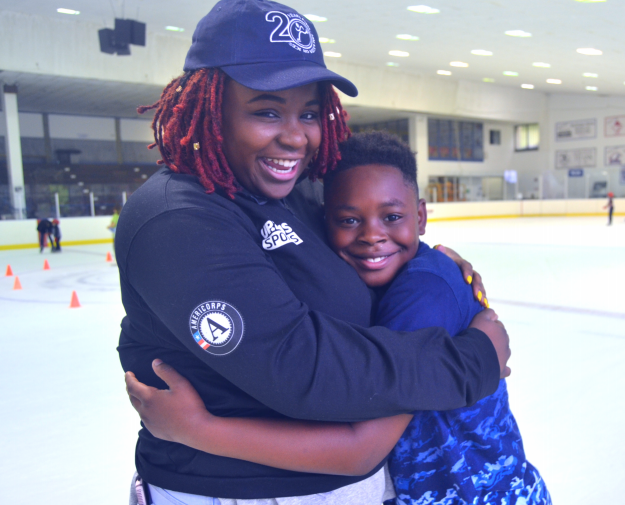 Up2Us Coach Chandlor Lyles is a Boston native who proves that even though she’s young she can make an impact on the lives she coaches at her alma mater, Fenway High School in Boston, Massachusetts. As a student at Fenway, Chandlor was the definition of scholar-athlete as she was involved in soccer, basketball and softball. Although she was heavily involved in sports, Chandlor made it her priority to keep her education first. Chandlor credits her sport, her father and coaches for her overall growth. Going into her coaching career she knew that she wanted to mirror the coaching style of her past coach, John Rice, who not only taught her the fundamentals of basketball but life lessons and the importance of the not being “just an athlete”. Chandlor kept her promise to Coach Rice when she attended Worcester Polytechnic Institute. There, she studied Management Engineering with a concentration in Mechanical Engineering. As a health and wellness and basketball coach, Chandlor has been able to motivate her students while also working full-time as a Project Coordinator at Dell. Chandlor has successfully been able to connect with her students just as she was able to do with Coach John Rice. In her time coaching at Fenway, Chandlor has created a safe and open space for her students and reassures them that if they “need someone to talk to, I’m always here”. Chandlor believes that you should be a coach first and friend second. This same mantra has made her students more proud of their various identities. She believes there is a real need for young and relatable coaches because of how they are able to capture the attention of their youthful demographic. Putting her words into action, Chandlor admits how proud she is of her own identity as a black woman. When asked about Black History Month, Chandlor acknowledges that during February she is unapologetically herself. She admits how grateful she is to have a month dedicated to the lives of black men and women who have prevailed in the midst of hardships. During this month Chandlor mentions, “we don’t have to explain our culture by force”. With great excitement, Chandlor explains her vision: alongside her fellow Up2Us Coach Coach Melika Clark at Fenway High School, they want to create a simulation of the African American Museum in Washington, D.C. Similar to the concept in the museum, she’d like to start with the uncomfortable truth of black history to present day America. Though Coach Chandlor appreciates the liberty of being herself during the month of February, she has her mom and a past professor to look to for inspiration and encouragement everyday. Chandlor’s mom - who proved herself to be the ultimate super mom - raised three children while also pursuing her career in law. Chandlor is thankful for her mom’s sacrifice and admires her perseverance. Her mentor during college, Adrienne, taught Chandlor how to embrace her identity as a black woman. Adrienne also has experience in the Engineering/IT industry, and warned Chandlor about the pitfalls she may face as a black woman in a white, male-dominated industry. Applying the advice from both her mother and mentor, Chandlor has made it her duty to let her work do the talking when people doubt her. To combat the negativity, Chandlor works “ten times harder” than her peers. This principle of hard work is something she insists on teaching her students. She admits how tiring it is to prove herself but she takes pride in persevering each time. In honor of National Girls and Women in Sports Day, Chandlor shared two of her favorite women athletes: Serena Williams and Candace Parker. She admires Serena Williams for her poise and willingness to stand up for what she believes. She thinks that Serena can be an inspiration to all athletes because she has been able to prove that no barrier is too great to overcome. As a former hooper herself, Chandlor aspired to be like the great WNBA player, Candace Parker. Chandlor notes how multi-faceted Candace is outside of her professional basketball career. Her ability to facilitate as a mom, an athlete and in-game analyst sheds a light on what it means to be truly more than an athlete. Chandlor is the perfect example of what it means to be a “Jill of all trades”. She has been able to make strides in the IT/Engineering industry while also building up a community of students at her alma mater. Just as she explains to her students, “you shouldn’t just be excellent on the field, you should also be excellent in life”.